House Speaker Paul Ryan's surprise—but not surprising—announcement that he will retire from Congress at the end of this term leaves the unified Republican government with little to tout in terms of healthcare legislative victories. During his two decades in Congress, Ryan fought to bring conservative ideas to the healthcare debate. Many were detailed in his 2016 "A Better Way" blueprint, which laid the groundwork for the attempted repeal of the Affordable Care Act and many of the Trump administration's regulatory efforts to curb Medicaid growth and overhaul insurance exchanges. Here are three policies championed by Ryan, but ultimately rejected by the public. Ryan and the rest of the GOP hoped to capitalize on Donald Trump's victory in November 2016 and finally fulfill a seven-year pledge to cast aside Obamacare. Yet the depth of the cuts to Medicaid and projected loss of health coverage for millions of Americans ultimately sank the effort. One observer noted that Ryan's experience as chairman of the House Budget Committee fueled his desire to curtail federal spending, including Medicare and Medicaid, all the while advocating tax cuts. In years past, Ryan proposed capping Medicaid funding and granting states more flexibility in setting coverage eligibility, including adding work requirements. While some states have added these provisions through CMS waivers, no national policy has made it through Congress. Health policy wonks in Washington, D.C., still talk about the Democrats' campaign commercial blasting Ryan's push for Medicare premium support, where a dark-haired Ryan body-double pushes "Granny" off a cliff in her wheelchair. Yet before those advertisements, Ryan worked with Sen. Ron Wyden (D-Ore.) on a premium support proposal laying out a choice of private plans or traditional fee-for-service on a Medicare exchange. Wyden walked away from the idea, but Ryan kept it alive in his budgets and in his "Better Way" outline. While Congress isn't likely to take it up anytime soon, Medicare premium support as a policy remains closely associated with Ryan. Ryan in his budgets also championed the idea of cutting Planned Parenthood out of the Medicaid program despite the idea's widespread unpopularity. Under the unified Republican Congress, Ryan kept pushing to defund Planned Parenthood, even as opposition from GOP Sens. Susan Collins of Maine and Lisa Murkowski of Alaska guaranteed such a measure wouldn't pass in the Senate. Ryan argued that community health centers could take their place in managing poor women's reproductive health. 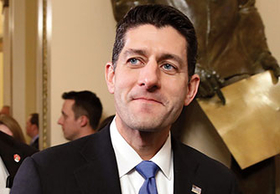 "By putting these dollars in the federal community health centers—for every Planned Parenthood, there are 20 federal community health centers—they provide these kinds of services without all of the controversy surrounding this (abortion) issue," Ryan said during a CNN town hall last year.